Centennial strongly believes that your corporate culture directly impacts your ability to attract and retain top talent. We know, firsthand, that Perfect 10 Corporate Cultures can provide valuable insight as you seek to develop and maintain a healthy culture in your organization. The Perfect 10 Solution™ is the only culture building tool that delivers sustainable, improved business results. That’s because only Perfect 10 has a proven method to fix root-cause, foundational problems. We work closely with you to improve bottom line business results by methodically helping you create a culture where employees want to work and customers want to do business. We call our time-tested, proven approach The Perfect 10 Solution™, reflecting our heritage in Olympic gymnastics, and because it delivers winning results. The Perfect 10 Solution™ is a complete solution to culture building. Depending on your situation, we can apply the entire model, or tailor an approach as needed. Our proven discovery tools reveal unlerlying issues, which are often hidden from management. We work with you to develop a comprehensive plan based on the insights from the Cultural Audit and our collective experience. We address the entire culture-building process. Our proven skill building approaches give your people relational and interpersonal skills that are the bedrock imperitives for building cultures. Our experience and highly skilled coaches know how to turn new skills into habbits and how to help people at all levels improve performance. 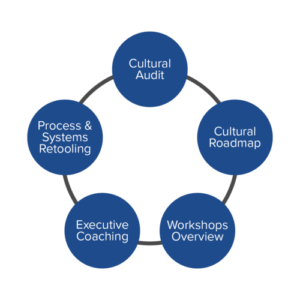 Our expert consultants combine proven tools and deep experience to guide business strategy, operations and systems, all which become more straightforward once the cultural foundation is established.